The transitional programme is the method which was employed by the pioneers of scientific socialism Marx and Engels in the ‘Communist Manifesto’ and was used successfully by the Bolsheviks to become the method of the first four congresses of the Third International (AKA the Communist International). After the Third International suffered bureaucratic degeneration it abandoned the transitional program and regressed to the old minimum (day to day achievable reforms) and maximum (some vision of organization in an unspecified socialist future) demands of the Second International (AKA the Socialist International) expressed in reformism and sectarianism, just as social democracy had done decades previously. The responsibility of building the revolutionary socialist consciousness rested upon the shoulders of the Left Opposition of the communist movement after this degeneration, and then later the Fourth International founded in 1938 when it was clear the Third was beyond salvation. The transitional programme is the only method which can build a socialist consciousness in the working class and create a bridge, as Trotsky described it between the current consciousness of the majority of workers and the final conclusion of the class struggle, that a socialist revolution is necessary to save humanity from capitalism. It is of paramount importance for a revolutionary party to have a correct method to build a revolutionary socialist consciousness in the working class, otherwise there will be no overthrow of capitalism and the transformation to socialism. Crisis does not result automatically to revolution. Imperialism (highest form of monopolistic capital) reached a most destructive phase in the 1930s and developed into the most murderous and bloody world slaughter which ended in the industrial extermination of an entire people and mass murder through the use of atomic weapons. Yet despite the huge desire among the masses in Europe and Asia for socialism, their misleaders helped prop up imperialism and throw consciousness backwards with a massive anti-communist propaganda onslaught. Trotsky was clear that if capitalism survived the Second World War it would see a new lease of life for world imperialism and would eventually lead to the Third World War. Today US imperialism dominates the planet, it has no equal and is entering its most predatory and destructive phase, as happened with German imperialism in the 1930s. The US has in its sights the semi-oppressed nations of Russia, China, Iran, Syria and North Korea. 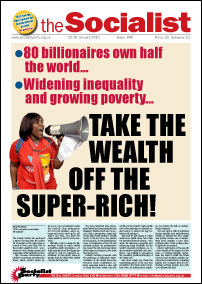 ● Tax the super-rich! For a socialist government to take into public ownership the top 150 companies and banks that dominate the British economy, and run them under democratic working-class control and management. Compensation to be paid only on the basis of proven need. So the same old call from Militant 50 years ago for taking over the top companies (only now its 150 not 200), running them under workers’ control and management, but they don’t indicate how, as if the ruling class will nationalise these companies anyway and grant workers the management of them. Even then it will be under capitalist state direction if it is just ‘renationalised’. The actual class nature of the state is never challenged in the statement. There will apparently be a ‘socialist government’ to do this. Then thrown in at the end the ‘democratic socialist plan of production’ and all the other examples of a socialist system which is again vague, and an example of a finished maximum program without any bridge to it. They do not formulate demands to raise workers consciousness in stages of struggle. As the SPEW have abandoned work in the Labour Party and thus distanced itself from the working class with the exception of those in public sector unions, its demands are aimed at no one in particular. This obviously bore no results so now they aim their demands or rather tailor them to the demands of trade union bureaucrats, particularly in the public sector and even the repressive bodies of the state (Prison Officers Association, POA), but if, as in SPEW’s case, you’re not fighting to overthrow the capitalist state then why not support the employees who staff its repressive apparatus against the working class? How should transitional demands be formulated? The Transitional Programme is not therefore a list of reforms all at once aimed at nothing thought up by a small group running a sect, and is not policies handed down from an enlightened ‘Socialist’ government in response to left demands. It must be a fighting program, hitting the base and structure of capitalist society, directing workers to take control of the material world and destroy the capitalist state, they would then need a new program to guide them using the material they control and can then build socialism through the workers’ state, the transitional program ‘brings the reader only to the doorstep’ of socialism. Hence the original ‘Transitional Programme’ was a draft for the period it was written in and not to be used as a Gospel as some sects do. The demands tackle the solutions to the objective circumstances with an embryo of socialist organization of society. The demands themselves while addressed as the solutions to the crisis of capitalism cannot be fully implemented through the capitalist state and therefore even if attempted partially can only finally be achieved through conquest of power by the working class. It encourages the working class to go further, even if the capitalists and the state are forced to give partial reform then further demands must be made especially as it becomes apparent that the capitalist state and the trade union and reformist labour leaders will not go further attacking the base of capitalism, a wall will be met. That is how the bridge from today’s understanding by the working class and the revolutionary consciousness of tomorrow is built. 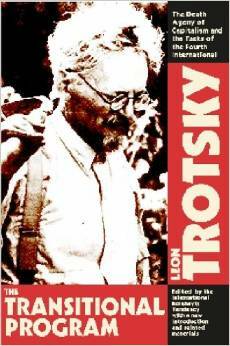 As Trotsky described the program as ‘an instrument to vanquish and overcome the backwardness’ . Knowing when and which demands to use at a particular time is important for revolutionaries. We do not present a whole list of demands all at once and always the same for years on end (as the SPEW does), the demands can change depending on circumstance, the symptoms of capitalist crisis at a given time and level of struggle by the working class. However the demands must always be addressed as a solution to the objective conditions under capitalism, after all the understanding of the working class can alter quickly ‘under the blows of objective crisis’. One way is to put the demands into easily memorable and understood slogans, which Trotsky described as ‘the program of socialism but in a very popular and simple form’. As we have said we must build on the demands the more success and penetration of the demands among the masses is achieved and their implementation until the point is reached where the working class understands and follows the revolutionary leadership to overthrow the capitalist state. Forty-hour week, wage increases. Workers’ control will demonstrate that the level of productive forces permits the reduction of the working day. Wage increases at the expense of the magnates of the Comite des Forges, of the Comite des Houilleres, of the Finalys, the Schneiders and the Staviskys, and to the material and moral advantage of the labouring people. Real social security and, first of all, unemployment insurance. Annual vacation of at least one month. Retirement pensions permitting one to live after fifty years of age. Equal wages for equal work. Abolition of the super exploitation imposed on women, young people, aliens and colonials. For working women, the same wages and same rights as for working men. Maternity protection with supplementary leaves of absence. For young people, wages equal to adults. Extension of study and apprenticeship at the collective expense. Special hygienic measures. France was in the grips of the capitalist crisis at this time and sections of the capitalist ruling class had attempted a fascist coup, only social revolution could have bought these demands then. Instead there was world war and then the capitalist upturn as there had been in the late 19th century which meant social reforms could be introduced, but today we are in crisis once again and the gains are gone or being eroded in the imperialist countries. Some of the basic demands are the same though. Observing current struggles is important to develop demands and slogans, as they must resonate with the masses. For example there are currently various movements based on occupations including among poorer sections of the working class such as the E15 Mothers which have taken on the problems created by capitalism which have impoverished them. Occupations have always been an important part of class struggle for workers under capitalism and is also in the original Transitional Programme concerning factory occupations. Full maintenance for unemployed workers at trade union rates. .Full freedom for Ireland, India and Egypt. Revocation of the policy of armaments. Credit for Soviet Russia. Scrapping of the shameful treaty of Versailles. In the present time demands for a return to union rights which have been eroded by Tory employment acts and taxing the rich to pay for public services would find wide support, and if the rich threaten to move their wealth abroad we should demand trade exchange controls and leading from that the demand for open and transparent accounting of all finance in the country and global trade and their wealth prevented from moving. The Labour leaders can no longer even promise to nationalize utilities, so even demanding this would run up against the capitalist state, however capitalist nationalization is not the answer, the demand should be the nationalization under committees of workers and consumers control and management without capitalists. If a demand such as this were to take on mass support in the labour movement and it became clear the leaders would betray it, which even under a left wing leadership would be the case for the reformists, and then the call for occupation of the utilities could be made. The same would be made for the banks, the demand could be made for the total appropriation of the banks and finance institutions by the state under workers’ control, in contrast to Brown’s buying of the banks with tax payers money like he did with RBS and Northern Rock to bailout the capitalists in 2008. There is a wide desire for decent public services even among more backward workers, but also distrust of government and big business of which public services are also seen as part of or under the influence of. Therefore demands for public services without unrepresentative governments and big capitalists, would find a hearing among workers and this could develop into the understanding that we could run public services if we occupy them and make them ours. This is transcending the capitalist state and property relations. When a revolutionary situation does develop and dual power becomes a prospect we must call on the working class and their organisations to take power from the capitalist state, as the Bolsheviks did in 1917, which exposed the political cowardice and impotence of the other parties who claimed to lead the working class such a the Mensheviks and Social Revolutionaries. We would also expose the cowardice of the official labour and trade union leaders. A similar demand could be made for Britain today, with abolition of the Lords and the Monarchy and election of Prime Minister and cabinet by the chamber. We could add that MPs earn the average of their constituents, how many right wing Labour MPs would there be then? Also the defence of Human Rights which are currently being eroded will find wide understanding. The improvement and protection of unemployment, housing and disability benefits is also an important demand and links to the question of who controls the wealth, and how it should be spent to pick up the devastating effects of capitalism. Socialism cannot be created in one country, it must be international; the struggle of workers against capitalism is worldwide. The defeat of world imperialism of the USA and the NATO block is of major importance. Therefore we must always agitate for solidarity with workers in struggle in other nations and national liberation struggles. As we are close again to world war we must warn the masses of the danger and demand the dismantling of NATO and the other military alliances protecting the interests of the US dollar. In Britain the call for nuclear disarmament can also be linked to how public money is spent and how it can be put to socially useful projects if workers could have control of public finance. As can a call to withdraw all troops from foreign occupation, including Ireland and linked to this the freeing of all Irish political prisoners and prisoners. The wars in Afghanistan and Iraq met with mass opposition. If such a situation were to develop ‘”””into a revolutionary crisis then we would begin calling for trade union rights for the ranks of the army we could raise the demand for the election of officers but only when the soldiers are mutinous during a revolutionary crisis, not in peacetime. The transitional programme is not and cannot be set in stone and used as a Gospel of some kind. It must be developed through as wide a discussion as possible, taking into account the struggles of the day and consider and the objective situation and how it develops. Demands stemming from these struggles can gain an immediate understanding among workers. They must be developed in the course of struggle, building from one to another. The demands must however be a solution to capitalist crisis which must in the final analysis pose to the working class that it can only be solved by the action of the class taking power and transcending capitalist property relations. The programme can then be a bridge from the struggle today to the socialist revolution of tomorrow. This introduction to ‘What we stand for’ appears on the back of every edition of ‘The Socialist’, newspaper of the SPEW.